Have you ever thought about how we get the energy to run the things we take for granite every single day. 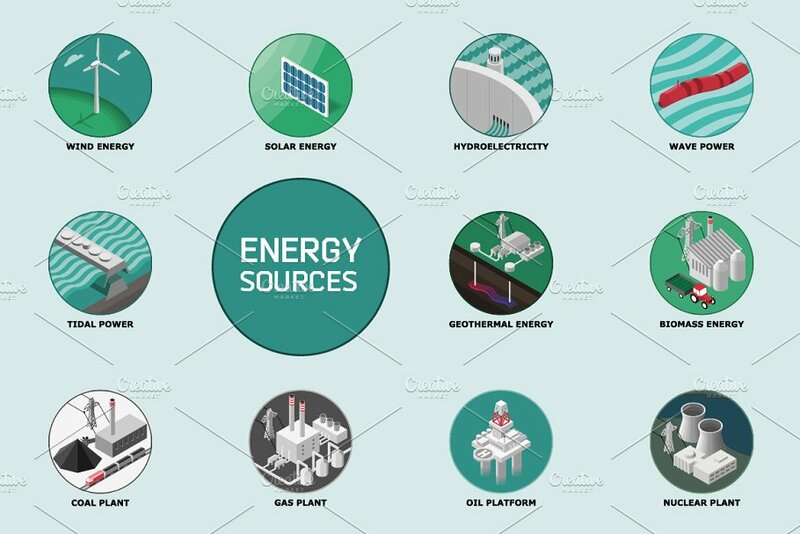 There are many sources of energy that that are used for transportation, heat, light, and the manufacturing of goods of all kinds. The development of science and civilization is closely linked to the availability of energy in useful forms. The seven main energy sources are fossil fuels, hydroelectric, solar power, win power, geothermal, nuclear power, and biomass energy. By harnessing the sun, wind, falling water, plant matter, and heat from the earth, energy planners expect to decrease the environmental impact n energy use. Most of the nonhydro renewable power comes through some form of combustion, such as the burning of biomass, landfill gas, or municipal solid waste. Little electricity comes from solar, wind, and geothermal sources. Factors that are increasing interest in renewable energy include cost advantages in niche markets, regulatory pressures, customer service requirements, fuel flexibility, and security. One of the biggest source of energy is fossil fuels. Fossil fuels have served as a reliable source of heat for cooking and warmth since the beginning of history. The common fossil fuels are coal, peat, lignite, etroleum, and natural gas. Coal gas, coke, water gas, and producer gas can be made by using coal as the principal ingredient. These such artificial gases can be used for fuel, illuminant, and a source material for the manufacturing of synthetic ammonia. Gasoline, kerosene, and fuel oil are made from petroleum. They are mainly used for transportation if the fuel is used in a liquid form. Natural gas is a natural mixture of gaseous hydrocarbons found from the ground or obtained from specially driven wells. The composition of natural gas varies in different localities. It is used extensively as an illuminant and a fuel. Some geologists theorize that natural gas is a by-product of decaying vegetable matter in underground strata. Others think it may be primordial gases that rise up from the mantle. Natural gas was known to the ancients but was considered by them to be a supernatural phenomenon because it appeared as a mysterious fire bursting from the ground. Gas is also a fossil fuel. It is a gaseous substance that burns in the air and releases enough heat to be useful as a fuel. It is advantageous if a fuel gas is readily transportable through pipes and is easily liquefied. Oil gas is a type of gas made by applying heat to various petroleum istillates. Its principal use is as a supplement to natural gas during periods of heavy demand. Coal gas may be any of a variety of gases produced by heating coal in the absence of air and driving off the volatile constituents. It is not as high in fuel value as other gases and often contains tars, light oils, ammonia, and hydrogen sulfide. These common fuels are used in industry, transportation, and the home are burned in the air. Scientists research and develop alternatives to gasoline every single day. One possible alternative is methanol, which can be produced from wood, coal, or natural gas. Another possibility is ethanol. Ethanol is an alcohol produced from grain and currently used in some types of US gasoline. A example of this is gasohol. It is a compressed natural gas, which is much less polluting than gasoline and is currently used by a half-million vehicles around the world. Petroleum is a fossil fuel thought to have been formed over millions of years from incompletely decayed plant and animal remains buried under thick layers of rock. The widespread burning of petroleum products as fuels has resulted in serious problems of air pollution. Oil spilled from tankers and offshore wells has amaged ocean and coastline environments. The environmentally disruptive effects of oil wells have sometimes led to strong opposition to new drilling, as in wilderness areas of Northern Alaska. Most of the energy consumed is ultimately generated by the combustion of fossil fuels, such as coal, petroleum, and natural gas. The world has only a finite supply of these fuels, which are in danger of being used up. Also the combustion of these fuels releases various pollutants, such as monoxide and sulfur dioxide, which pose health risks and may contribute to acid rain and global warming. Environmentalists have become ncreasingly alarmed in the latter half of the 20th century at the widespread destruction imposed on sensitive wild lands during the exploration. Some examples of these wild lands are the tropical rainforests, the arctic tundra, and coastal marshes. Hydroelectric power is an important source of energy. Hydroelectric power or water power is a mechanical energy derived from falling or flowing water, such as rivers, streams, and the overflow of dams. Water flowing from a higher level to a lower level (a dam or waterfall) is used to activate a turbine that drives an electric generator. The amount of power urnished is proportional to the rate of flow of water and the vertical distance through which it falls. During high demands the facility produces electricity by using the water that flows down the reservoir. A dam is a barrier to hold back water. They are commonly across a watercourse and often forming a reservoir or lake. Dams are made of timber, rock, earth, masonry, or concrete or of combinations of these materials. Timber is used in dams because timbers are impermanent and their height is limited. Rock dams consist of an embankment of loose rock with either a core impervious to water or a watertight face on the pstream side. Earth dams may be either simple embankments of earth or embankments reinforced with a center of cement. Masonry and concrete dams are either gravity dams or arch dams. Gravity dams are dependent upon their own weight for resistance to the pressure of the water. Arched dams are curved upstream and are usually constructed in narrow canyons or gorges where the rocky side walls are strong enough to withstand the tremendous lateral thrust of the dam that is caused by the pressure of the water. Most dams are constructed for multiple purposes. To provide for irrigation, to aid flood control and help mprove the navigability of waterways, and especially to furnish power for hydroelectric plants. Some dams built to provide hydroelectric power include the Aswan dam and the Itaipu Dam. The Aswan High Dam is one of the world’s largest dams. It is located on the Nile River in Egypt. The dam is 4 miles long, 375 feet high and 11,811 feet long. The dam has a hydroelectricity capacity of 10 billion kWh. The downfalls of hydroelectric is that is it is a very expensive project to build these such dams. Most of the energy consumed from the dams can only be used within 100 mile radius. The last downfall is that you have to have large body of water to have a dam, therefore many areas of the world don’t have these bodies of water. Another source of energy is solar power. The earth receives huge amounts of energy every day from the sun, but the problem has been harnessing this energy so that it is available at the appropriate time and in the appropriate form. Solar power or solar energy is only received during the daylight hours, but more heat and electricity for lighting are needed at night. Solar energy is expected to become a more viable and competitive source of energy by the end of the 20th century. Several solar thermal power plants are ow in operation in California, but they are not yet able to compete with conventional power plants on an economic basis. Some forms of solar energy are light, radio waves, and X rays. Solar energy is needed by green plants for the process of photosynthesis. It is the ultimate source of most foods. Natural collection of solar energy occurs in the earth’s atmosphere, oceans, and plant life. The photovoltaic cell is a semiconductor diode that converts light to electric current. When light strikes the exposed active surface, it knocks electrons loose from their sites in the crystal. Practical photovoltaic cells re currently about 10 to 15% efficient. Solar cells have long been used to provide electric power for spacecraft. One important solar energy application concentrators is a solar furnace. They are ideal for research requiring high temperature and contaminant-free environments. Solar cooling can be achieved through the use of solar energy as a heat source in an absorption cooling cycle. Solar power research is being pursued in connection with efforts to design residential and commercial buildings that will use energy more efficiently. Some other promising devices are solar collectors and solar mirrors. Solar energy is a very expensive process that take years to develop the technology for it. This energy can only be used in the daylight ( when the sun is out ), so during the night you wouldn’t have energy then. Another important source of energy is wind power. The most popular device is a mechanical device that harnesses wind power in order to pump water, grind grain, power a sawmill, or drive an electrical generator. This device is called a windmill. Windmills were probably not known in Europe before the 12th century, but then they became the chief source of power until the steam engine. The windmill is very useful on farms where farmers need water to irrigate their crops on the farm. The windmill pulls water from underground water wells so it can be used for irrigation. The windmill is also made for decoration and sold for large amounts of money. It is very expensive to make and you have to have a large land space to put a windmill on. Also, the windmill makes so much noise that it can’t be put near any houses. A wind turbine is used to generate electricity. They are even designed to on in light winds. The wind turbine is a huge invention to make work easier, throughout the whole course of time. The next important energy source is a type of energy called geothermal energy. Geothermal energy is based on the fact that the earth is hotter, when drilled deeper below the earth’s surface. Some scientists have suggested using the earth’s internal heat as a source of energy. Such energy derives from steam trapped deep in the earth. Brought to surface, it will drive a turbine to produce electricity. Geothermal energy is released naturally in geysers and volcanoes. In California, 7% of the state’s electricity is generated by the geothermal plant complex known as the Geysers, which have been in production since 1960. The energy we get from the ground is then transferred into energy through a long and expensive process. We can drill into the earth’s surface and get the energy from many places throughout the world. It is much easier to get this energy than getting it from a windmill. Geothermal energy is used in electric power generation and direct heat applications such as space heating and industrial drying processes. It was developed for electrical power in 1904 in Tuscany, Italy, where power production continues today buildings in the vicinity. A hot spring is a form of geothermal energy that is a natural ischarge of groundwater that has a elevated temperature. Most hot springs result from the emergence of groundwater that has passed through or near recently formed hot igneous rocks. Iceland, Yellowstone Park, and North Island of New Zealand are known for their hot springs. A geyser is a hot spring which water and steam are ejected periodically to heights ranging from a few to several hundred feet. Geothermal generating plants use geysers to produce electricity. Nuclear power is another important energy source. Nuclear power or nuclear energy is the energy stored in the nucleus of an atom and released hrough fission, fusion, or radioactivity. The release of nuclear energy is associated with changes from less stable to more stable nuclei and produces far more energy for a given mass of fuel than any other source of energy. The development of nuclear energy made available another source of energy. The heat of a nuclear reactor can be used to produce steam. Then it can be directed through a turbine to drive an electric generator. The reactor is so constructed that the fission of atomic nuclei produces a self-sustaining nuclear chain reaction, in which the produced neutrons are able to split other nuclei. Nuclear nergy is measured in millions of electron volts. Any electric power generating plant is one part of a total energy cycle. The uranium fuel cycle that is employed for LWR systems currently dominates worldwide nuclear power production. This cycle has many steps and takes a lot of time and money. If any nuclear items spill or contaminate anything a special team is brought in with special suits to clean it up. Nuclear energy is said to be here on earth for a very long time. The last energy source is biomass energy. Biomass energy is the fuel energy that can be derived directly or indirectly from biological sources. Biomass energy from wood, crop residues, and dung remains the primary source of energy in developing regions. In a few instances it is also a major source of power, as in Brazil, where sugarcane is converted to ethanol fuel. In China’s Sichuan province fuel gas is obtained from dung. Various research projects aim at further development of biomass energy, but economic competition with petroleum has mainly kept such efforts at an early development stage. Corncobs are an important source of furfural, a liquid used in manufacturing nylon fibers and phenol-formaldehyde, refining wood resin, making lubricating oils from etroleum, and purifying butadiene in the production of synthetic rubber. Ground corncobs are used as a soft-grit abrasive. Large, whole cobs from a special type of corn,”cob pipe”corn are used for pipes for smoking tobacco. Corn oil is extracted from the germ of the corn kernel and is used as a cooking and salad oil and in solid form as margarine. It is also used in the manufacture of paints, soaps, and linoleum. The search for alternate sources of energy has made corn an important fuel source. It is also processed to produce alcohol for use with gasoline as gasohol and the dry stalk is a fuel biomass. The cons for biomass energy is that the items used in this cycle is so scarce that it is very hard to find. One time in the future all of the items will be unavailable and cannot be used. The demand for energy has increased steadily, not only because of the growing population but also because of the greater number of technological goods available and the increased affluence that has brought these goods within the reach of a larger proportion of the population. Despite the introduction of more fuel-efficent automobiles, the consumption of gasoline by vehicles in America increased by 18% between 1973 and 1989. The rise in gasoline consumption is attributed to an increase in the number of miles the average person travels and to a 42% increase from 1973 to 1989 in the number of cars on the road. By harnessing the sun, wind, falling water, plant matter, and heat from the earth, energy planners expect to decrease the environmental impact of energy use. In this vision for the future, renewable energy sources would complement fossil fuels and, eventually, emerge as a significant energy source. Despite various legislative incentives over two decades toward this goal in the US, however only a small fraction of electricity needs are supplied by renewable energy technologies other than hydropower. Most of the nonhydro renewable power comes through some form of combustion, such as the burning of biomass, landfill gas, or municipal solid waste. Relatively little electricity comes from solar, wind, and geothermal sources. The limitations on renewable energy’s progress to date result from its relatively high cost and the economics of the utility industry. It is faced with an increasingly competitive environment and is generally awash in surplus power. Although renewable energy technologies have vercome a number of formidable technical hurdles to bring costs down and increase reliability, further progress has been prevented by the lower cost of natural gas and the efficiency of gas-fired generating plants. As costs continue to decline, the renewable energy market can be expected to grow, particularly if possible global warming trends continue to be linked with greenhouse gases such as those emitted by fossil fuels. Other factors are that increase interest in renewable energy include cost advantages in niche markets, regulatory pressures, customer service requirements, fuel flexibility, and security.